We are excited to announce that the women’s GIE of Fass will start to garden this week. Thanks to World Connect, who offered the women a grant for the project, we have dug a well and installed a solar pump and fencing at the site in Fass, so the infrastructure for a successful agricultural program is all in place. Two members of Fass's GIE. The women have been learning proper agricultural techniques, including soil preparation and planting, from Abib over the past few months. In the coming weeks they will be putting that knowledge into practice by putting seeds into the ground. We couldn’t be more thrilled than to be starting this project with the women of Fass, for whom this garden will be an important source of food and income. Bravo! For the second time this year, Dr. Maggie Carpenter and her team from Go Doc Go came to Senegal to conduct trainings on cervical cancer screening and lesion removal. The sessions allow healthcare providers in Senegal to learn new techniques and to comfortably incorporate them into their own practices. Go Doc Go donates all of the necessary equipment to the providers, and conducts all of the screenings for free. It is a fantastic program, and we were again thrilled to be working with Go Doc Go to improve women’s health in Senegal. Dr. Carpenter and healthcare providers in Kolda, Senegal. On October 10 and 11 in Dakar, Dr. Carpenter was joined by Dr. Juliette Faye, and together they trained four doctors and fifteen midwives, and screened over 100 women. The team next went to the regional hospital of Kolda, where they trained thirty healthcare providers — doctors, nurses and midwives — and screened over 175 women. We are so grateful to Dr. Carpenter and her team, and we look forward to future collaborations. Dr. Maggie Carpenter leading a cervical lesion removal training session. Augustine Diouf and Adrisa, a member of the Sinthian apiculture collective, are taking the first step towards beekeeping in Sinthian: hanging catcher boxes, which will attract bee colonies. Once the group has enough bees in these boxes, they can divide the colonies among other hives to ensure their health and encourage good honey production. Adrisa looking for the ideal spot to hang a catcher box. For the second year in a row, the field across from Thread is playing host to a regional soccer tournament. Ten teams, whose players all come from villages surrounding Sinthian, are vying for the championship. The first qualifying matches were held on September 18 and 19, and now four teams will play in the semifinals on September 29, with the final match taking place on October 6. The tournament, which has already brought 2000 spectators to Sinthian in its opening days, is a unique opportunity to unite the area’s inhabitants. It also allows more people in the region to learn about Thread’s programming — agricultural, cultural, and educational — and avail themselves of the center’s resources. In August, we hosted two assessors from Project C.U.R.E., the Denver-based nonprofit which donates used medical equipment to hospitals in need, so they could examine Fann Hospital, Tambacounda Hospital, Keur Djiguene Yi (The Women’s Center of Dakar), and the Sinthian and Fass medical clinics. They found plenty of supplies and equipment to be lacking in each location, and are in the process of working to see what’s available at their warehouses to be shipped to Senegal. Project C.U.R.E assessor David at Fann Hospital in Dakar. While those supplies will be entirely donated by Project C.U.R.E., the crating and shipping must be paid for by Le Korsa, or we must find funding for it elsewhere. We are thrilled to announce that SHARP, the Cork University Hospital’s employee charity, has offered Le Korsa a 14,700 euro grant to cover the costs of shipping a container to Fann Hospital in Dakar. We are profoundly grateful to all the doctors, nurses, and administrators in Ireland who have made this donation, which will greatly improve the working conditions of their counterparts in Senegal, and by extension, thousands of patients’ lives. Great grant news! Better agriculture is coming to Fass. Mariamma Kante, who is pictured below, was one of the many women who showed us two weeks ago just how successful the gardening program initiated by Le Korsa has been for the village of Sinthian. With the women regularly harvesting okra, peppers, and sweet and bitter eggplant, this is the first year in which everyone in Sinthian will have an ample food supply, even throughout the dry season. We are thrilled to announce that a similar program is coming to the women of Fass, who live just nine kilometers from Mariamma on the other side of the Gambia River, but who lack the same resources. Sinthian resident Mariamma Kante, after harvesting eggplant and peppers. World Connect, an exemplary non-profit, is giving the women of Fass a $10,500 grant to start a market gardening program in their village. The money will pay for a pump, a well, tools, fencing, and education so that the women can, at the start, grow food for the table. The vegetables they grow will be vital in an area where most people simply do not have enough to eat, and malnutrition and diabetes are rampant. ​Now the women ​will be growing enough so that there is nutritious food for everyone and a surplus that can go to market and be sold for their benefit. As in Sinthian and Dialico, Le Korsa will be working with the women in Fass to teach them proper agricultural and gardening techniques, and to help them organize into an officially registered collective to manage their income, labor, and governance. We send our profound thanks to World Connect, and to you, who make our work possible. We hope you will join World Connect in supporting one of our programs. Dr. Badiane and his neurosurgery team just informed us that the ultrasonic tissue ablation machine, which Le Korsa helped Fann Hospital to acquire, has arrived. “We installed it and put it immediately in the operating room … Thank you, thank you, thank you!” Dr. Badiane wrote. The new ultrasonic tissue ablation machine at Fann Hospital. The machine, which provides ultrasound imagery and a precision suction device, will allow Dr. Badiane and other surgeons to more safely, and more effectively, remove cancerous tumors and other malignancies from delicate brain tissue. Brian Harris, Le Korsa’s Dakar Office Director, just sent along this wonderful report on projects in Sinthian, which are in full swing now that the rainy season is underway. One of the gardens in Sinthian. “The trip started as Boubacar came to pick me up in Kolda and take me to Sinthian. I arrived to find Thread virtually empty, aside from a young boy rolling around on the cool tile floor. With Moussa in the U.S., ‘uncle’ Augustin and Angelic on home leave, and Abib in the field, Boubacar told me that Magueye was here to watch the center while he ferried me from Kolda. I went over to greet Magueye and saw immediately that the clinic was teeming with patients. I stuck my head in his office where he sat with a patient. I quickly said hello and we exchanged post-Ramadan greetings, casually asking each other for forgiveness. I got out of his way and headed back to Thread, passing the brand-new, all white pick-up ambulance as it was being washed. I took inventory of Thread, mostly wandering around the beautiful building and its burgeoning garden. I looked past the building and saw recently tilled fields where corn, millet and groundnut were just beginning to sprout. I saw the cows, looking slightly fatter and happier than I had seen them two months ago, in the middle of the dry, hunger season. I saw the young boys perched on top of termite mounds, batting sticks and howling as they successfully protected their family’s field from those same hungry cows. I thought I might find Abib out in Djelico at the primary school extension garden. Instead I found Aliou Dialo, our local ‘facilitator’ – a term used by Abib which I love and am now using. Aliou gave me a warm reception and showed me around. Things were slightly chaotic as the government is building a new classroom where the old thatch-roofed one stood, leaving bricks and piles of sand around. The women were wrapping up their final round of gardening within the school and are planning to exclusively work within the extension space, which is currently brimming with okra. They are more efficient with the new basin in place and with water in their well. The women are quickly outgrowing this space and are already asking for more! Furthermore, they are planning on collectively farming 1 hectare of groundnuts, using the same model designed and executed in Sinthian. One of the basins in Djelico. I met Abib back at Thread where I found him standing over the new tree nursery containing hundreds of young mango and cashew trees. He promptly took me out to see the rice cultivation project, which Moussa and Abib successfully brought to Sinthian. We drove one kilometer into the bush until it opened up into a great big field dotted with trees. Sinthian’s village chief, Mr. Kanté, was standing at the edge of a freshly tilled field watching a brand new Brazilian-made tractor moving in the near distance. Part of what is included in this project, along with seeds, fertilizer and herbicide, is 70 hectares of tractor access for only 10% of cost. It was really a moment to behold the scope of development here and I appreciated that it was happening with the local population at the forefront. This was the first time the land here was ever tilled by tractor, and both Abib and Kanté were there to ensure it was happening correctly. The tractor at work in Sinthian, preparing fields for rice planting. Two days later, I got over to the Sinthian extension garden. It is truly one of the finest market gardens I have seen in Senegal: the beautiful layout, the interspersed moringa and mango trees, the giant bitter tomatoes, the furry carrot tops, the rows of young eggplant and the towering okra. Clearly, this was Abib’s baby. Abib offering some lessons in Sinthian. However, shortly after we arrived, Mouro Njay shows up and Abib starts giving him directives. Abib tells me he is our Sinthian facilitator and representative for ActionAid (our partner in this project). Mourou Njay is a young adult with a very positive attitude and a strong work ethic. He also became very close with Matthias Persson during his residency and effectively played the role of artist and production assistant. It was fitting to see him working hard in the garden, finding joy and belonging in being part of our projects. Children gather at Thread on a daily basis. Congratulations to Toshiko Mori and Jordan MacTavish of Toshiko Mori Architect, who designed the building. Congratulations, also, to Nick Murphy and Moussa Sene, Thread’s directors, as well as to the residents of Sinthian and the visiting artists who continually enliven the space with their collaborations, demonstrating the power of intercultural connection. Building on the success of the many agricultural activities in Sinthian, this fall a group of men will begin beekeeping and honey production on a dedicated site just north of Thread. The project was initially envisioned by Yaya Diallo, Le Korsa’s former agricultural coordinator, who worked with villagers to clear a hectare of land for the hives, and installed raised platforms on which they will sit. A bee box in the Kolda region, where Le Korsa staff visited a honey making operation. Le Korsa has offered a loan to the villagers to purchase the materials necessary to make honey, and four Le Korsa staff members — Abib Dieye, Moussa Sene, Brian Harris, Augustin Diouf — will travel to the Gambia in November to learn apiculture. When they return, they will teach the locals to manage the hives and produce honey, which will be used for personal consumption as well as sold at market. The long term goal is to create an income-generating activity for the village, and to create an environmental sanctuary where the bees can thrive on flowers and trees. The villagers have already declared that the site will be protected from firewood harvesting. We will keep you posted as the project develops this fall. The Sinthian women’s collective, which has been using Thread as a base for agricultural training, has been awarded a grant of $30,000 from the Senegalese government to develop a rice plantation. The Sinthian women's collective at work in the fields. “The objective of the program at the national level is to reach food self-sufficiency through strategic products such as rice, maize, beans and fonio,” said Moussa Sene, the general manager of Thread, who works closely with the women. The grant will allow the women to work on an agricultural scale heretofore unknown to them, and to ensure greater food security — and income-earning potential — for them and their families. Planting during the rainy season. Although the women only applied for this grant recently, its origins go back to April 2014, when they decided to form a Groupement d’Intérêt Economique (GIE), or a collective, to operate and manage a community garden on the site of Thread. Their goal was to grow crops to supplement their food supply and to sell at market. Le Korsa provided the women with a small loan for supplies and seeds to get them started, and offered them agricultural training so they could learn proper watering, plant-spacing, fertilization and pest control techniques. The opportunity to expand into rice-growing comes at a perfect time​. If all goes well, Le Korsa hopes that the program can be replicated in the villages of Dialico, Fass,​ and Bouchra. ​Meanwhile, huge congratulations to the women of Sinthian​ and to Moussa! We are excited to announce that Thread, the artists’ residency and cultural center in Sinthian, has been shortlisted for the Aga Khan Award for Architecture. The award is unique among other cultural prizes because “it selects projects – from slum upgrading to high rise ‘green’ buildings – that not only exhibit architectural excellence but also improve the overall quality of life,” according to the Aga Khan’s website. Thread and the other nominees are all undergoing on-site review by specialists, who include architects, engineers and conservators, and will be subject to a final review by a jury. The eventual winner will receive $1 million in prize money. Congratulations are due to Toshiko Mori and Jordan MacTavish of Toshiko Mori Architect, as well as to all of Thread’s staff and the residents of Sinthian, who truly make the building a vibrant place. Please visit the Aga Khan Award for Architecture website for further information. On April 25 and April 26, AFLK invited Dr. Seydou Badiane to lecture at St. Mary’s Hospital in London, and at Cork University Hospital in Cork, Ireland. The lectures provided Dr. Badiane with an opportunity to share his work, and the state of pediatric neurosurgery in Senegal, with colleagues and medical students in Europe. He highlighted many of the disparities in resources and care that exist between hospitals in Europe and those in Africa, and provided an overview of the many conditions and diseases that he and his colleagues face. Dr. Badiane and Dr. Ian Lush at St. Mary's Hospital in London. Dr. Badiane and Dr. Seamus O'Reilly in Cork. Lecturing at Cork University Hospital. The audience at St. Mary's in London. Over one hundred people attended each lecture, with latecomers finding only standing room. 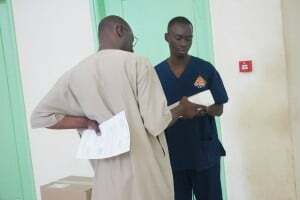 Our hope was that Dr. Badiane’s talks would inspire more doctors and medical students to support him and his staff at Fann Hospital in Dakar, be it through supplies, trainings, or knowledge exchange. Doctors and nurses at Fann routinely work in conditions that most in Europe would find substandard. They often lack basic supplies such as surgical gloves and hand sanitizer, and yet they persevere and save many lives. We offer a huge thank you to our partners at St. Mary’s and at Cork University Hospital, who helped to make Dr. Badiane’s lectures possible. And, of course, we thank Dr. Badiane for all of his work, and for his excellent lectures. Thread, the cultural center and artists’ residency in Sinthian, recently won two jury awards from Architizer, the world’s largest online database for architecture. Because Thread is a building that is truly for building community, we are pleased that it won A+ awards in the “Architecture and Community” and “Architecture and Humanitarianism” categories. A meeting of the women's agricultural collective at Thread. Since its inauguration in March 2014, the center has played host to countless village meetings, art and agriculture workshops, and artists from all over the world. It is everything from an educational space to a fruit tree nursery. Congratulations are due to Toshiko Mori and Jordan MacTavish of the firm Toshiko Mori Architect, who designed the building, but most of all to the many people who make Thread, on a daily basis, the vibrant place that it is. Dr. Maggie Carpenter and Dr. Amy Gueye leading a training in Dakar. “I wanted to create a NGO that would allow interested providers from the United States to travel abroad and volunteer their services,” Dr. Carpenter said. “Most opportunities for doctors are either religious in nature or require a career commitment,” she added. Since founding Go Doc Go in 2012, Dr. Carpenter and a team of volunteer physicians have made multiple trips to Ethiopia, where they’ve taught healthcare providers to conduct cervical cancer screenings and treatments, and donated related medical equipment to a university hospital. After learning about Go Doc Go’s work, we immediately thought it could have a positive impact in Senegal. Dr. Juliette Faye, who heads AFLK’s women’s health center in Dakar, agreed, explaining that cervical cancer screenings — and the knowledge and equipment to treat cervical cancer — were lacking throughout the country. Dr. Amy Gueye teaching lesion removal technique to healthcare providers in Dakar. Shortly thereafter, we put Dr. Faye in touch with Dr. Carpenter and Dr. Amy Gueye, a volunteer physician with Go Doc Go, and they began working on a program. Dr. Gueye, who has Senegalese heritage and completed part of her medical studies in Senegal, also enlisted the help of her mentor in Dakar, oncologist Dr. Kasse. Together, this formidable team undertook almost a year’s worth of planning, from translating some presentations into French to recruiting doctors and patients for the trainings. Finally, in February 2016, the team was ready. Dr. Carpenter and Dr. Gueye joined AFLK in Dakar and Tambacounda to conduct trainings in cervical cancer detection and treatment. Between the two cities, the doctors trained over 40 providers — physicians, nurses and midwives — and screened almost 300 women. Go Doc Go also provided Tambacounda Hospital with cryotherapy and LEEP equipment, so that the doctors who undertook the training on that equipment can now use it, both for treating cervical lesions, and for training other providers. “The providers were extremely knowledgeable and hardworking,” Dr. Carpenter said, noting that the challenges doctors face most of all in Senegal are a lack of medication and supplies. That is why AFLK offers grants for medication and supplies; to alleviate some of the burden on doctors, so that they can best treat those who need medical care. Thanks to an AFLK donation, Dr. Faye received equipment for the women’s center with which she can treat cervical cancer. Thanks to Go Doc Go, she is now trained to use it. “I hope we can make these trainings an annual event, not only in Dakar, but throughout Senegal,” Dr. Faye said, speaking on behalf of all the doctors and patients who were trained or screened. We send an enormous thanks to Dr. Carpenter and Dr. Gueye, for their work on behalf of the doctors, and women, of Senegal. “You can’t imagine the enormous good you have done for the Saint Anne’s medical center.” These are the words of Sister Annie Clarisse Youm, the manager of the medical center at Saint Anne’s School in Thiès, who wrote to thank AFLK for the recent grant, designated for the purchase of medical supplies, which we offered Saint Anne’s early this year. One of the Sisters at Saint Anne's showing the new sterilizer. Although Saint Anne’s medical center, which provides much free and low-cost prenatal and infant care, is better equipped than some of the places AFLK helps to support, it still lacks many basic supplies. “As soon as I could, after learning we had received the grant, I made arrangements to purchase a sterilizer, four new IV stands and an auriscope,” Sister Youm wrote. “We can now have sterile bandaging material, and can conduct our work without having to tie IV units to the windows or the refrigerator with thread. With the auriscope, we can better detect ear infections in our patients, and also look for any abnormalities in the throat,” she added. The auriscope and the four new IV stands. This is great news for the children at Saint Anne’s, and we are glad the material is already being put to good use. Over the last few months, we have been working with German medical supply company Servona to deliver new wheelchairs to Fann Hospital in Dakar. Servona generously donated the wheelchairs, along with other supplies, and agreed to cover the cost of the shipment; we at AFLK worked with our contacts in Senegal to ensure it all arrived securely and safely. The shipment has arrived, and Dr. Badiane and his staff at Fann are thrilled with the wheelchairs. In Senegal last week, some members of our team stopped by to see the supplies and to speak with Dr. Badiane. “You can’t believe how our nurses’ eyes lit up when they saw [the wheelchairs],” Dr. Badiane said. “They are going to make the work here so much easier, and are going to be so much more comfortable for patients as they move around the hospital,” he added. In its first year, Thread, the artists’ residence and cultural center in Sinthian, has played host to numerous village meetings, artists’ workshops, movie screenings, agricultural trainings, and has charged many a cell phone (most homes in the village have no electricity). The interactions between visiting artists and locals that take place within the center’s open walls, Josef Albers-inspired brickwork, and two oculi are quickly becoming part of daily life in the village. The brickwork at Thread was inspired by a Josef Albers design. A view from Thread's interior. Visiting artist Siri Johansen in a knitting circle with women from Sinthian. Women on the way to water crops they are growing at Thread. We’re pleased to announce that Thread’s architectural design has been singled out for praise by several publications. Architectural Record included Thread in its “Class Favorites: Best Projects of 2015;” Wired Magazine featured it in “The Amazing Architecture that Captivated Us in 2015;” and Azure Magazine honored it as one “The 10 Best Cultural Buildings of 2015,” in good company with the new Whitney Museum in New York and the Broad Museum in Los Angeles. Congratulations are due to Jordan MacTavish and Toshiko Mori, of Toshiko Mori Architect, who designed the building pro bono; Nicholas Murphy and Moussa Sene, Thread’s Director and General Manager, respectively; and to all of the artists and inhabitants of Sinthian who make the building so much more than a building. In partnership with the Foundation for West Africa, and L’Union des Radios Associatives et Communautaires du Senegal (URAC), we are working on an exciting project that will bring a community radio station to the Tambacounda region, where currently there is only access to government-run and commercial radio stations. As of this week, we have secured a license to set up a station in Gouloumbou, a village on the main highway between Tambacounda and Kedougou. It is located just at the turn-off to Sinthian, where we have many projects. Such a station will ensure that the local populations can voice the needs of their communities, access fair and sound journalism, and receive news pertinent to their daily lives in a range of local languages. In the video above, Awa Diouf, a member of URAC who conducted the feasibility study for the station, speaks about the positive impact community radio will have in the area. We will keep you updated as we work to make the station operational. While we were in Sinthian last month, we had the opportunity to hear some French recitations from students at the village’s primary school, who had been focusing on perfecting their vowel sounds. A student at Sinthian primary school giving a recitation in French. Just a few years ago, these students were among the first to attend the village’s Kindergarten, which AFLK constructed in 2010 and still maintains, to ensure that children in Sinthian, where most people speak Pulaar, could learn French and other basic subjects at a young age. When students develop those skills early, they are more likely to advance in the Senegalese education system, in which the language of instruction is French. Some of the vowel sounds students have been studying. The classroom in Sinthian's primary school. It’s clear that the first classes of Kindergarteners were well-prepared for the challenges of primary school. Of course, they also have an excellent teacher in Aliou Niakhassou, who directs the primary school, and continues to be one of our close partners in Sinthian. The women of Sinthian, who have been working with AFLK staff members Yaya Diallo and Moussa Sene to learn new agricultural techniques, and to grow vegetables and other crops both at Thread and in the surrounding fields, have recently harvested their crop of peanuts. They estimate to have brought in over 1 ton of the ground nuts, which are a crucial cash crop in Senegal, and will be a significant source of income — a kilogram can be sold for between 200-300 FCFA in the markets, depending on the season. Some of the many sacks of peanut hay that were gathered during the harvest in Sinthian. The women have also gathered the “peanut hay,” or the straw and tops from the peanut plants, which they are storing until the market is right for selling. This is all good news for the women of Sinthian, and an important way for them to continue to improve their economic situation. If you head south from Tambacounda towards Kedougou, you pass a medical center called Wassadou. The center has 15 beds, serves a region of around 20,000 people, and is staffed by one full-time doctor and one midwife, as well as other administrators and nurses. Wassadou was originally a project of French NGO Le Kinkeliba, which founded it in 2006, and for many years it operated at high capacity, providing crucial health services in an isolated region. But its services declined after Le Kinkeliba stopped being able to fully support it. In 2014, the center was handed over to Première Urgence, a French NGO that is now running it. We are pleased to announce that AFLK has decided to partner with Première Urgence to help restore full services at Wassadou. Its staff is dedicated and is doing great work, but many of them have had to take pay cuts, and much of their equipment is in disrepair. We will be offering a grant to help restore the staff’s salaries to the appropriate level, and will be working closely with Première Urgence to develop a long-term plan. In the rural villages of the Tambacounda region, the rainy season is over, which means the academic year is just underway. But in Goumbayel, Bamba Sagna, the local school director, was hard-pressed to hold classes because his students lacked the basic supplies — pens and pencils, notebooks, erasers, t-squares and protractors — that they would need to take notes and practice arithmetic. So Mr. Sagna called AFLK to see if we could help, and thankfully we could. Teachers and students in Goumbayel. AFLK has just awarded a small grant to the school to help Mr. Sagna acquire the necessary materials. Moussa Sene, the General Manager of Thread, who is based in Sinthian, was able to purchase the supplies and deliver them to Goumbayel on December 2, where he was greeted by Mr. Sagna and local representatives, including the Imam. The supplies included notebooks, pens, detergent and more. Thanks to this quick intervention, classes have begun. Dr. Seydou Badiane, chief of neurosurgery and teaching physician at Dakar’s Fann Hospital, has just sent a note saying that the grant we recently awarded to Fann has made a huge difference: already half the brain shunts that the staff purchased have been put to use, and the pharmacy has restocked with essential medicine. “We no longer have trouble supporting our emergency room patients, because supplies are now available around the clock, and are always at hand for the doctor-on-call,” Dr. Badiane said. Dr. Badiane also informed us that the hospital is in need of bone wax, a crucial medical material that helps to control bleeding from bone surfaces during surgery. We are working on it, but if you or anyone you know might help us get more bone wax to Fann Hospital and Dr. Badiane, please let us know! Thread has been featured in the latest issue of AFRIKArchi magazine; please click here to read an online version of the article. AFRIKArchi is a French non-profit association devoted to promoting architecture and urban renewal throughout Africa. Yaya Diallo, whose education AFLK has supported from adolescence through his university degree and licensing in agro-forestry, is now Coordinator of Agricultural Projects for AFLK. Since April, he has been managing an AFLK-funded initiative to help women earn income through market gardening, or small-scale agricultural production, in the villages of Dialico and Sinthian. In both villages, women have formed associations in order to organize the harvesting and selling of okra, and have learned key agricultural techniques in the process. Yaya Diallo at a village meeting in Dialico. In August, we saw the projects firsthand, and heard from Yaya about how they were developing. “In Dialico, the women harvest 20-25 kilograms of okra every three days, and one kilogram of okra is sold for 700 CFA,” Yaya said. That’s approximately $1.20 per kilogram, so every week the women can earn almost $30 from the crop, which is a considerable sum for the area. They pool their income through a Groupement d’Intérêt Economique, or a consortium designed to promote economic advantage, with the goal of having enough funds to undertake other projects. Prior to working with Yaya, the women of Dialico were growing okra, but were expending greater energy for a lesser yield. The increased production — and decreased difficulty of labor — is thanks to the installation of a solar-powered pump for the village’s well, which feeds an irrigation system deployed throughout the garden. Yaya and Moussa Sene, the General Manager of Thread, helped the villagers set up the system. “When we installed the pump, it was a huge change,” Yaya said. “The time the women spent watering went from two hours to 30 or 45 minutes,” he added. The beginning of the growing season in Dialico. Because Dialico is in the arid region of Tambacounda, where the rainy season lasts but three months, it has an extremely deep well — dug to approximately 80 feet — in order to reach the water table. The labor required to haul up water from that depth, and then to carry it throughout the garden, was extremely taxing for the women. “Often, they wouldn’t even finish watering everything in one evening,” Yaya said. But now the pump distributes the water easily and efficiently, and not just to the garden, but to the villagers for general usage as well. “Everyone relies on it for all their needs, from laundry to drinking water to bathing to household chores,” Yaya said. Women in Sinthian planting the garden at Thread. In Sinthian, the women are also making use of a solar-powered irrigation system to grow okra, but having not had prior experience with the crop’s cultivation, they are doing it on a smaller scale than at Dialico. “There, it’s an experiment in teaching the women to become market gardeners,” Yaya said. The women have planted a parcel of land on the site of Thread, which yields four to six kilograms of okra every three days. They sell the crop among themselves in the village, but are gaining confidence in their farming capabilities and plan to expand. “We are currently looking for a larger growing site,” Yaya said. “The women told me that they had always tried to have a market garden, but this is the first time that they have actually seen the fruits of their labors,” he added. The garden at Thread in August. In Sinthian, as in Dialico, the goals are to keep expanding the projects so that the women can improve their economic situation. Thanks to the women’s hard work, and the expert assistance of Yaya and Moussa, we are seeing that it is possible. We at AFLK are always trying to think of new ways in which we can help people improve their access to healthcare, and so their health and well-being, in the Tambacounda region. One of our goals is to bring health specialists to the region so that they can share their expertise with the local doctors and nurses. In August, we were joined by Paris-based physical therapist and professional masseur Alexandre Guillaumin, who traveled to Sinthian to train Dr. Magueye Ba in basic physical therapy techniques, and to treat patients suffering from musculoskeletal problems. Alex is a longtime friend of AFLK who has visited Sinthian twice before, and on a prior visit, he and Dr. Ba had discussed the idea of Alex returning to work in the local clinics. Alex Guillaumin and Dr. Magueye Ba treating a patient together. “During my other two visits to Sinthian, I used several different massage techniques on Dr. Ba, who, because of his work, had back problems,” Alex said. “Because of that, Dr. Ba asked me if we could organize some open hours at the Sinthian medical clinic, during which I could use similar techniques to treat some of his patients, because there are no physical therapists or specialists in musculoskeletal problems in the Tambacounda region,” Alex added. Alex Guillaumin showing Dr. Ba proper massage technique. “Over five days, I worked in the medical centers of Bala, Fass and Sinthian, seeing about two dozen patients. Most of these patients were suffering from chronic lower back pain as a result of working long hours in the fields or the banana plantations, and being bent over most of the time. While I treated these patients, I also trained Dr. Ba in a few techniques that he could use on his own to treat these conditions,” Alex said. In addition to showing Dr. Ba specific procedures he could use to treat patients, Alex also provided patients with stretching regimens they could perform on their own in order to alleviate their conditions. Alex will be returning to Sinthian once per year to continue working with Dr. Ba. Assane Sal Sow, a scholarship student who is supported by American Friends of Le Korsa, recently completed a Level 3 English course in the Amideast / Tunisia Language Course. Assane attends university in Tunisia, and is in his fourth year of studying food engineering and the food industry. “These studies were always my dream,” Assane said. “Senegal has many agricultural products which are not transformed into food by a lack of enterprise,” he added. Assane is now thinking about ways to use Senegal’s raw products, such as mangoes, tomatoes, bananas, and milk, to help develop a food industry throughout the country. After graduation, Assane plans to spend a year abroad — perhaps in Canada — working in project management, so his strong English skills will be very helpful as he looks for a position. He then plans to return to Senegal to put his experience to work in the agricultural and food sectors. Bravo, Assane! All of us at AFLK wish you luck in your fourth year! Please click here about more information on American Friends of Le Korsa’s scholarship program. Between August 1 and August 15, American Friends of Le Korsa’s United States-based staff were in Senegal to meet with staff and partners in Dakar, Tambacounda and Sinthian. Over the next few weeks, we’ll be posting reports and photos from the trip, but we wanted to start by posting some photos of our visit with Madame Khady Guèye, director of social services at Tambacounda Hospital. In the courtyard of Tambacounda Hospital. Madame Guèye graciously showed us some of the medical equipment that AFLK, in partnership with Project C.U.R.E., helped to donate to the hospital in March. One of the hospital beds. A nurse showing some of the new equipment in the pediatric ward of Tambacounda Hospital. A scale in the pediatric ward. We recently added an extraordinary young friend to our list of supporters: Sam Bruchet, a 12-year old boy from Cork, Ireland. He has raised over 500 euros for AFLK by completing a series of athletic feats, which included running 3.2 miles, swimming 25 pool lengths, hitting the crossbar of a soccer goal five times, and playing a round of tennis. Sam’s generous family and friends sponsored him to complete these challenges. Sam, whose mother Fiona Kearney is the director of the Lewis Glucksman Gallery in Cork, has known about our work since first meeting AFLK’s Founder and President Nicholas Fox Weber several years ago. But it was just earlier this spring that he decided to help. In June, he presented his donation to Mr. Fox Weber, along with a letter that detailed the physical tasks he completed to raise the 500 euros. In the regions of Senegal where we do our work, 500 euros is enough money to pay for cataract surgery and follow-up treatment for someone who otherwise would not have a chance of it, or to send two children to kindergarten for a year, or to provide life-saving nutrition for scores of infants and toddlers. Les Amis du Korsa (LAMKO) is a French non-profit association created in 2015 to support medical, educational, agricultural and cultural projects in Senegal. It welcomes donations which are deductible up to 66% from French income tax. The association is a French cousin of American Friends of Le Korsa. LAMKO’s immediate mandate is to provide financial support for AFLK’s current and future projects. New projects may also be developed in response to major donations by individual philanthropists. AFLK’s work is concentrated in an arid Pular-speaking region of eastern Senegal. In the town of Tambacounda, it provides assistance to a local hospital and a foyer which houses students from villages attending secondary school. Some receive AFLK scholarships for higher education. In the village of Sinthian, it supports a medical center, a kindergarten and an elementary school and it recently built a cultural center which serves as a residence for foreign and Senegalese artists and an arena for local cultural events. In the nearby village of Fass, AFLK supports a medical center and has plans to build an elementary school. In addition, in Dakar, Senegal’s capital, AFLK provides help to a major hospital, a women’s center and a mother-child health project in a poor neighborhood. The founders of LAMKO have visited these projects and endorse AFLK’s strategy of working with local leaders – teachers, doctors, artists and sportsmen – to address specific needs. Nicholas Fox Weber, the Executive Director of the Josef and Anni Albers Foundation, is president of both AFLK and LAMKO. Run by volunteers, the French association has no overhead costs. AFLK’s administrative costs do not exceed 2% of donations. On May 5, a truckload of splendid hospital equipment arrived at Tambacounda Hospital. The surgical operating table, hospital crib, seven beds for the intensive care unit, incubators, IV poles, boxes of baby bottles, syringes, speculums, bandages, surgical gloves, and other supplies had started their journey in Denver, Colorado. It took eleven years for this to happen, but the material is already being used, and the gift has been celebrated by local doctors and government officials and in the newspapers, giving people in that isolated city, statistically the hottest on the planet, incalculable happiness. The new supplies from America are delivered to the hospital staff. The bill of lading reads like poetry to me. And even though the videos of the arrival sent to me by the hospital’s superb and devoted director include, in one instance, the sight of a carton of supplies falling off the back of the densely packed truck in which it arrived, one can feel nothing but joy about this. In 2004, when Gilles Degois took me to Senegal for the first time, we went to Tambacounda Hospital. He handed over a duffle bag full of vials of blood, desperately needed there, which he had brought with him from Paris. The director gave us a tour. He showed me the one surgical operating table, so dilapidated that it could no longer be raised or lowered, and told me that a second table had been stolen en route. I resolved in my mind to try to get them a new table, and, returning to my usual haunts, asked friends at Yale New Haven Hospital and doctors in New York and Ireland if there were discarded tables available for this part of the world where a secondhand table, not necessarily the latest model which would be wanted at more prosperous institutions, would be an incredible gift. There were lots of promises, and no follow-through. The surgical table is unloaded at Tambacounda Hospital. Other supplies are in the surrounding boxes. Then, some three years ago, a friend, Deborah Kobe Norris, took interest in what AFLK was doing. Debbie joined one of our trips, after which her daughter Ellie, excited by what she learned about us, did research on used medical equipment in the U.S. Ellie discovered Project C.U.R.E., an exceptional non-profit organization based in Denver that has warehouses full of material no longer considered prime by American hospitals, but renovated as needed and in good working order. AFLK got in touch with Project C.U.R.E. and funded the trip of Dr. Martina Schulte who does site visit evaluations for the organization to determine equipment needs. Marty’s report resulted in Project C.U.R.E. approving the donation of three containers of material, with highly detailed lists of what was most necessary having been worked out by our indefatigable director Allegra Itsoga, Marty, and doctors and nurses in Dakar, Sinthian, and Tambacounda. Moustapha Diouf saw to the details of the first two containers, ensuring that their contents were delivered to Fann Hospital and the clinics in Sinthian, Fass, and elsewhere. And, less than two weeks ago, Louis Valentin went through hell and high water to hand original documents to the right people and overcome unimaginable bureaucratic obstacles in order to get that precious container through Senegalese customs. At one point, the situation became so dicey that I wrote to anyone I thought might help, and Azeb Rufin and Seydou Badiane, the first in Paris and the second in Senegal, responded immediately and went to bat for us with the right people. Louis plugged away tirelessly, practically sleeping on the docks. He prevailed, and the container was released. It was unloaded, with the rich contents filling a large truck to the brim, and finally transported on the ten hour journey to Tambacounda. We agreed to fund the containers and the transport; Project C.U.R.E. agreed to give material worth about $1.5 million. I went to Dakar to meet with the Minister of Health to obtain an exoneration of import duties and other charges at customs, since, as is now the case in Nepal, the government usually imposes prohibitive taxes and fees even on donations to non-profits from non-profits. My greatest fear had been that, as happens with so many gifts to Senegal, the donation would sit in the port and then eventually be returned to the donor or sent elsewhere. A father visits his child in the pediatric ward of Tambacounda Hospital. Tambacounda Hospital is the only hospital in a vast region. It is at a crossroads for travelers to Mali and Guinea, where a large population is treated for malaria, the consequences of road accidents, and a range of other illnesses and difficulties. It has a staff of dedicated professionals, a devoted director who has moved from the comforts of Dakar to this less desirable outpost in order to serve the people in his country who most need him, and, above all, patients who simply want to live and enjoy decent health. We thank you wholeheartedly for all that you have done to make this possible. AFLK recently awarded a grant of $10,000 to Saint Anne’s school in Thies, an hour south of Dakar, to pay for the installation of mosquito netting and louver slats on their windows as well as fans for all of the classrooms. Before this grant, the students at Saint Anne’s had two choices: sit in a closed classroom in the sweltering African sun with temperatures that more often than not reach well beyond 100 degrees, or open the windows to allow a bit of airflow and battle the barrage of malaria-carrying mosquitos. With this grant, nets dipped in mosquito deterrent and fans that help to circulate cool fresh air protect them. Students are now able to concentrate on what is most important: their education. A child dies every minute in Africa from malaria. Nets are the number one way to protect them. Five Local Hospitals Receive Medical Supplies from Project C.U.R.E. Our partnership with Project C.U.R.E., a Denver based NGO that provides refurbished and recycled medical equipment and supplies to the developing world, has been extremely fruitful. Two shipping containers, with over one million dollars in goods, arrived safely in Dakar this month. Each was packed with a variety of medical equipment, consumables, and furniture for use at five local hospitals to which AFLK has provided support for almost a decade. The recipients were thrilled with the donation.Dr. Magueye Ba of the Sinthian and Fass medical centers told AFLK that infection due to equipment deterioration has always been an additional problem and said “What a relief to have such modern equipment and consumables that meet hygiene standards.” A third container will arrive shortly with supplies for a sixth hospital as well as extra goods to help all of our colleagues with Ebola prevention. Upon a special request from AFLK, Project C.U.R.E. arranged for extra boxes of gloves and bottles of disinfectant to fill every available inch of space in the container, in order to take advantage of the shipment and guarantee hospitals have access to these desperately needed supplies. Simple items such as gloves and soap can mean the difference between an isolated case of Ebola and a full-fledged outbreak similar to what is happening in Liberia, Guinea, and Sierra Leone. Josef Albers used to talk to me about reacting quickly and effectively to the givens of a situation. He said that open eyes, practical knowledge, and dexterity could lead to simple, gratifying solutions. Many of you have already heard about Allegra Itsoga’s response to people’s concerns about Ebola in Senegal. This is a recap of her initial steps and an update on the results. After returning from Senegal in September and then hearing that a single case of Ebola had been identified at Fann hospital, a scene of a lot of our work in Dakar, Allegra, Director of AFLK, was determined for us to help, to the extent feasible, to ensure that Senegal does not become the home of the next outbreak in West Africa. She asked Magueye Ba, the doctor at the Sinthian and Fass medical centers, our main bases in the extremely rural and isolated villages where AFLK operates in the region not far from the Gambia River, and Seydou Badiane, our close colleague who is head of neurosurgery at the Centre Hospitalier Universitaire de Fann, where he specializes in brain surgery on small children, how we might help. They and Allegra quickly developed a list of necessary supplies, and she determined the least expensive and most efficient way to deliver them. The goal is to ensure that, in the event of an outbreak, the medical staffs at these institutions have the necessary tools to isolate any cases and prevent further spread of the disease. Boxes of gloves, bottles of disinfectant, protective eye goggles, and other supplies were purchased, and our staff members based in Dakar delivered them in a matter of days. In addition, AFLK assembled 1000 “Ebola Protection Kits” for distribution in Sinthian. Each kit contains a box of rubber gloves, two bars of soap, hand sanitizer, a large bottle of bleach, a bag that can be sealed to dispose of contaminated items, and a poster teaching villagers how to recognize the symptoms and stop the spread of Ebola. All items are stored in plastic buckets that can itself be used in the cleaning and disinfecting process. A team of student nurses, led by Idiatou Diallo, whose studies we have helped support through one of our scholarships for many years, has been distributing one kit to each family in Sinthian and the neighboring villages, and conducting educational seminars on how to recognize the symptoms of Ebola and the importance of seeking help immediately if exposure or infection are suspected. Allegra also got in touch with our superb allies at Project CURE, the Denver-based non-profit that helps us bring large containers of medical equipment to Senegal. In the shipment that will be delivered at the end of the year, Project CURE will fill every inch of available space with extra boxes of gloves, and bottles of disinfectant, packing them around the operating tables and wheel chairs and blood pressure monitors and other material being given. Our colleagues in Senegal say that these rudimentary supplies are desperately needed. Gloves and soap can mean the difference between an isolated case of Ebola and a full-fledged outbreak similar to what is happening in Liberia, Guinea, and Sierra Leone.